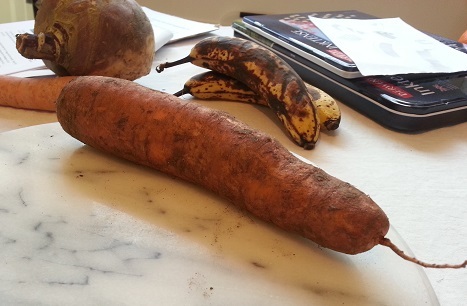 Select some pieces of fruit and vegetable. Draw each of the individual pieces in your sketchbook, in whatever medium you choose, paying attention to the shapes or planes that make up the outline. Because the last exercise, ‘tone’ was a disaster in both mind and execution, I felt I needed to free up and relax into this exercise. I chose some items that that had their own unique texture and patterns with the different shapes representing a ‘tonal’ challenge. 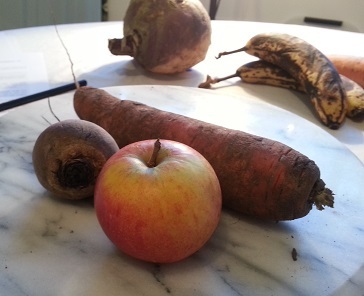 These are a carrot, an apple and a beetroot. Another indecision I had with the previous exercise was what media to use? I’d changed my mind, dismissed, and then retried media so that I got fed up before I had even started! So for this exercise I decided to use a selection and stick to them. 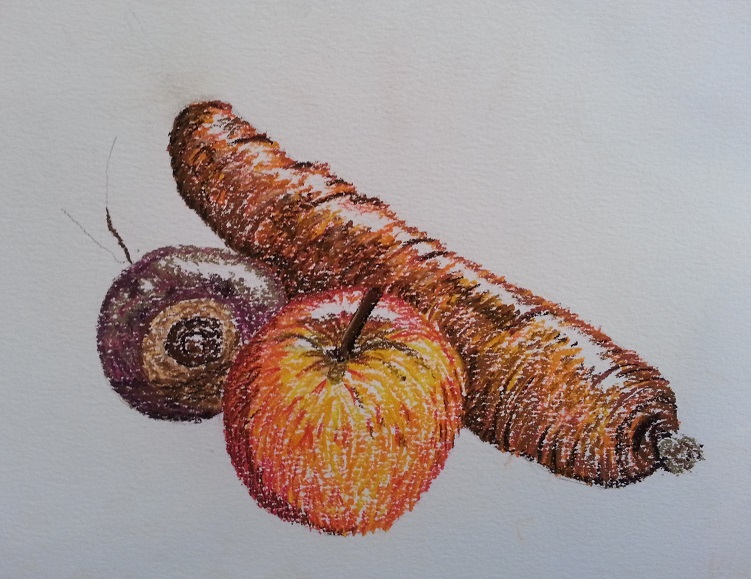 These are ink, pastel, conte and inktense pencil. I set up a strong directional bright light from the right to help me see the tonal contrast. First I did some quick studies in my sketchbook to try out different media for each item. I decided to set up the composition on a marble plate. 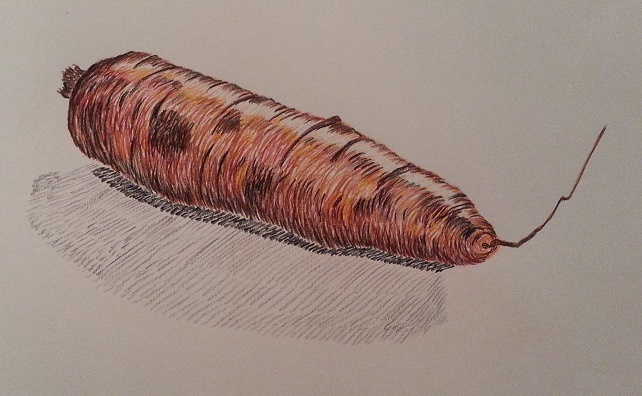 First I carried out tonal studies of the carrot. I changed the light to natural and the direction to front right. By screwing up my eyes I told my brain to distinguish 3 distinct areas. Using pencil, I managed to separate out 3 areas which I am quite pleased with. It wasn’t easy to prying apart tone form the actual colours. 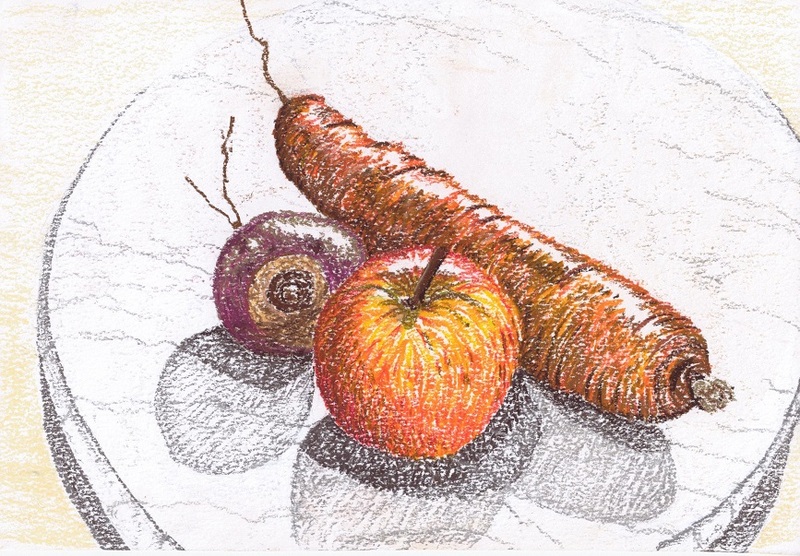 Using this pencil study I used coloured pencils and conte crayon to hatch to build up the shape and tones. 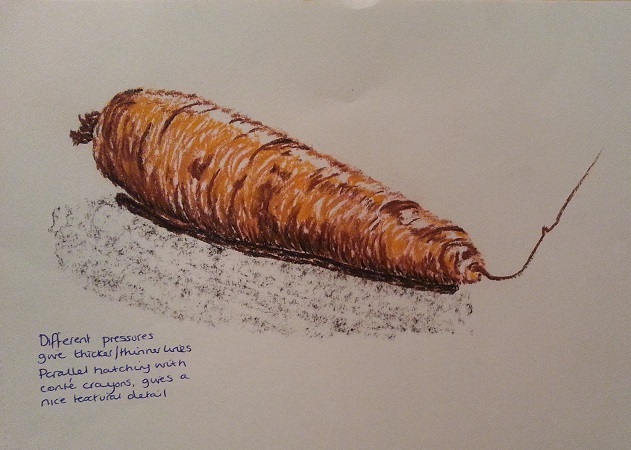 For the final drawing, I decided to use pastels. Before I started I took a black and white photo to look at the tones. I still found it difficult to separate out areas even with this photo. I started with a light pencil outline drawing on textured paper. 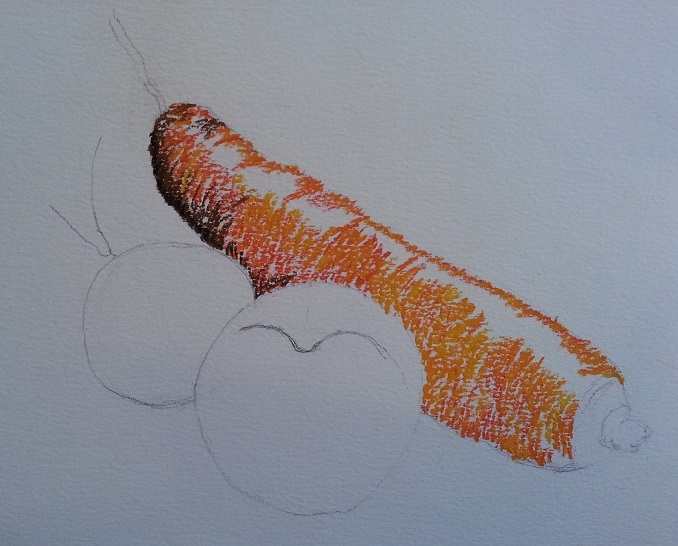 Starting with carrot, I worked from light to dark, using a variety of colours. I started with the lightest colours, deciding to cover the entire shape except for the highlights area with the mixture of yellow and orange colours and build up from there. I put down the darker orange in the area where the darkest tones were so that I could hatch over with dark browns/blacks and create optical mixing, keeping the brightest orange fresh. By applying the pastel very lightly, the paper picked up the pigment and left the white of the paper showing through. Because the pastels are very soft, the marks soon became very thick and I had to be mindful to keep a sharp edge on the pastel for thinner lines, for variation of marks. 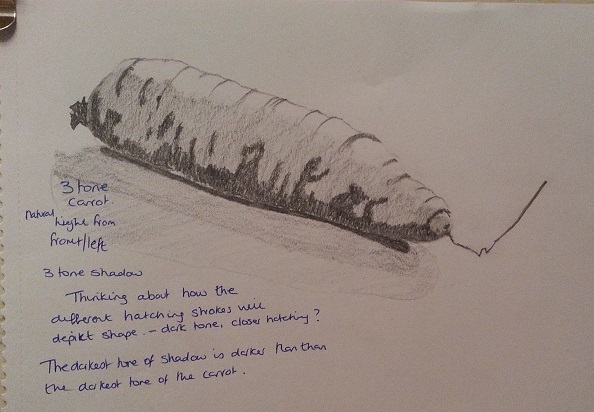 I had to control the hatching to stop it evolving into shading. 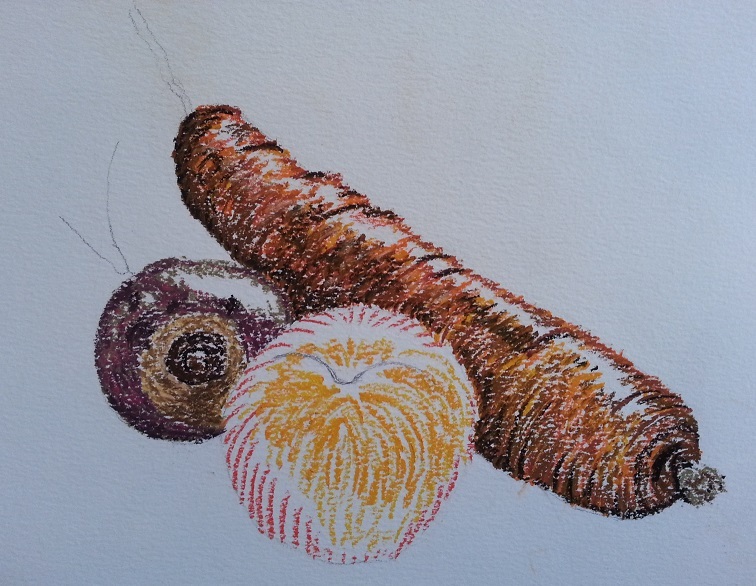 By applying a slightly heavier pressure more pigment was deposited and filled the ‘tooth’ of the paper. I made very small hatching marks, more akin to stippling. I wanted to keep the tooth of the paper as much as possible, so I made sure I didn’t overlay too much or press to hard. I found by trial and error that I needed to put in the lightest areas first because I didn’t like going back over a darker colour as too much pigment was laid down, clogging up the paper. 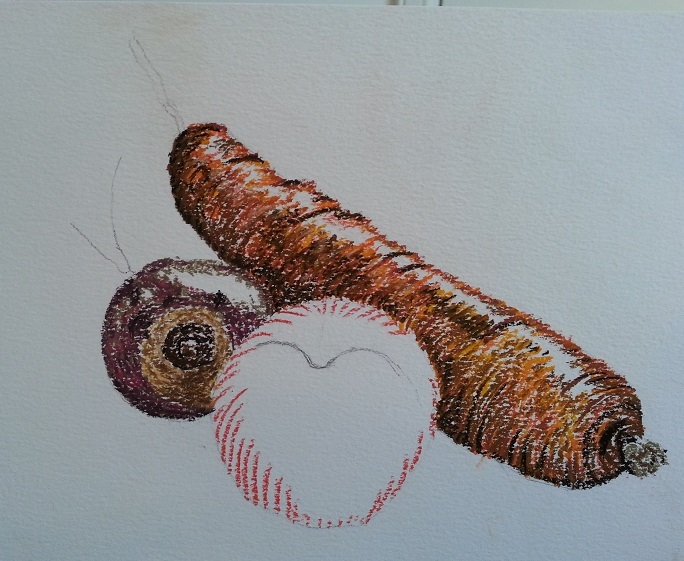 Whilst working on the beet I left the dust created from the darker colours on the paper and worked it into the other lighter colours around the leaf stalk. This gave a nice variegated effect. 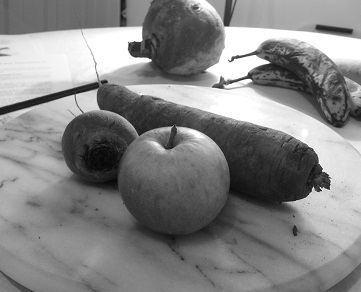 I used the same technique for the beet and the apple using the lessons learned from the carrot. 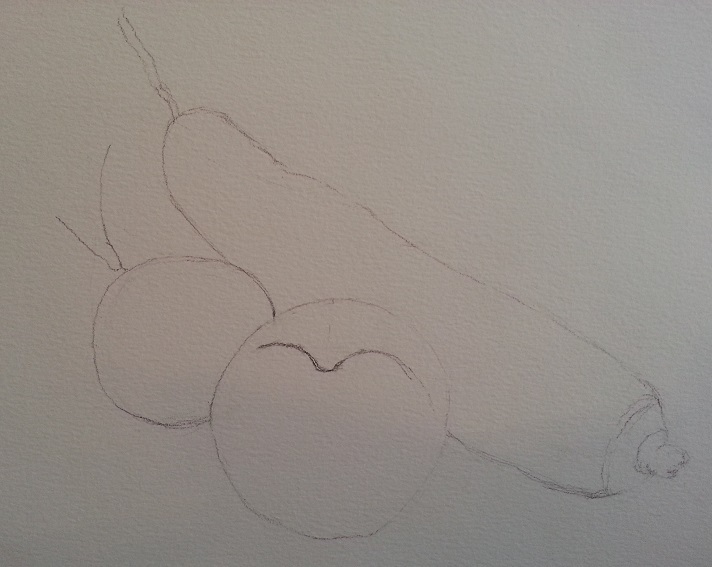 I felt more comfortable drawing the apple. Overall I think this is a successful drawing in technique. 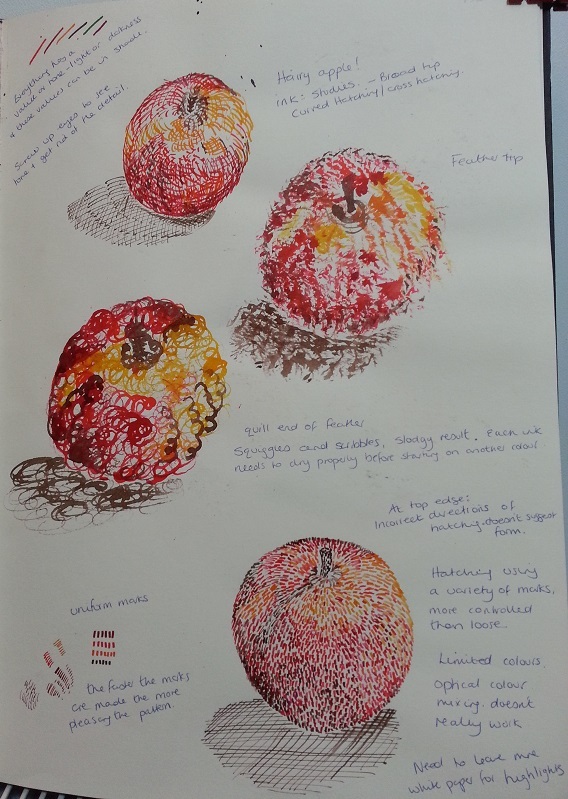 To be critical, the composition may not be the best as the apple sits looks more or less centred, but I liked the way a larger object was brought to the front giving the drawing a bit of impact. 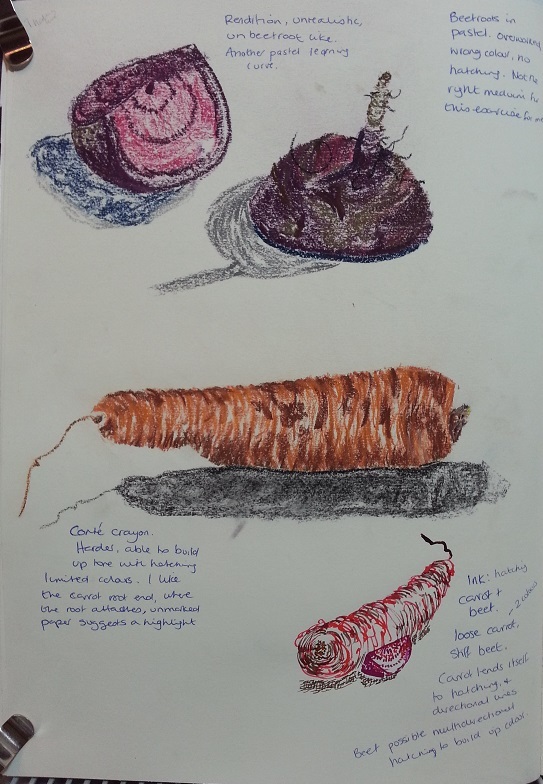 In the end I started to enjoy using pastels, I couldn’t seem to get to grips with them at the start, hence the issues with the ‘tonal’ drawing, where I forced myself to use them. I’m glad I used them as I think it will be a medium I will choose again.